When I was 13, I woke up one morning and could not move or walk on my right foot. I had always been healthy, so this came as a shock. I had a number of consults and progression of symptoms throughout my entire body to the point of being bedridden, in excruciating pain, unable to be touched, and my limbs developed contractures while being swollen and blue/purple in color. I was finally diagnosed with a chronic neurological disease associated with dysregulation of the central nervous system and autonomic nervous system that results in multiple functional loss in the bones, muscles, nerves, skin, and blood vessels. I spent the next few years in and out of different hospitals, undergoing daily therapies, invasive treatments, and surgeries. With the support of my family, friends, and teachers, I was able to keep up with my schoolwork and returned to high school my senior year. I managed to graduate on time and went away to college in Memphis and then to graduate school in Boston. I worked hard in college and double majored in Biology and Psychology, as I was influenced so much by my health and how the two were intertwined. Because of my personal experience staying in the hospital for extended periods and my interactions with all the kids and families I met, I spent much time volunteering my time doing art projects with the kids at St. Jude Children's Research Hospital in Memphis. I also worked alongside the division chief of Radiation Oncology in the clinic and doing research on the effects of radiation on cognition, attention, and memory in children with brain tumors. While I was in Memphis things were not perfect with my health, but I was enjoying my life and did not let anything stop me. After graduating I moved to Boston to pursue my graduate studies where I obtained my M.S.Ed., specializing in severe special needs and my teaching credential. I worked full time with kids with various disabilities ranging from bipolar disorder, schizophrenia, Down Syndrome, Autism, and much more. I was enjoying life and couldn't be happier. But starting around late 2007, my health declined as my immune system got very weak. Finally, I became extremely ill with a terrible infection and ended up suddenly in the ER with a spiking fever, my blood pressure dangerously low and heart rate dangerously high. My immune system had attacked my nerves, spreading quickly so I was exhibiting signs of quadriplegia. After years of working so hard with my recovery in my teens and resuming a more “normal” life, I was once more struggling and in a place of much frustration. Physically, it seemed like I would never gain my independence. I was not progressing with my rehab and was only getting more fragile. Again, I wanted the life that all my friends had in their 20’s. I knew something had to change. After sitting around brainstorming one day, I decided I needed to try hippotherapy (horse therapy). I was never that girl running around in cowboy boots with all my breyer horses when I was younger. I knew nothing about horses! They only came into my life at a time when I needed them the most. I just knew that this was the one thing that was somehow going to help me; so I didn’t back down. From the first day I was paired up with Lusco, something changed within me. Interestingly, the movement and sensory input from the horse can be used to address things such as posture, balance, sensory integration, coordination, and mobility in people with disabilities. Once I started, I saw so many changes emotionally and physically, and I wanted to be challenged every day. I am now a Grade II para-dressage rider who’s training for the 2018 World Equestrian Games and the 2020 Paralympics with my Lusitano gelding, Real Erbeo. Dressage is a competitive equestrian sport where you are required to perform a sequence of pre-determined movements with your horse. It is sometimes referred to as “horse ballet.” Para-dressage is currently the only equestrian discipline in the Paralympic Games and was introduced in 1996. As para-dressage riders, we are able to show and compete alongside our peers, no matter our physical disabilities. Many might think the word “para” in para-equestrian or para-dressage may mean paralyzed. 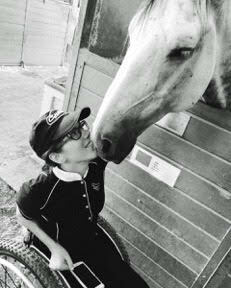 However, para-equestrians are made up of people of all sorts of disabilities. “Para” literally means parallel and as riders we go through the same exact training, rules, and regulations as any other person would. “Para” refers to the sport of dressage, so that we are able to show and compete alongside our peers no matter our physical disabilities. This is one of the reasons why I love this sport! When I’m on my horse, no one should be able to recognize that I have any sort of disability limiting my capabilities. I need to be performing at the same level as my able bodied peers and have a horse that is just as capable of performing all the same movements. This pushes me to train just as hard as anyone else, every single day. This sport is also wonderful because it is accessible to so many people. It is not limited to people of only one type of disability. Para-dressage has a classification manual that is recognized at the national and international level that has a series of profiles determined by numerous physical tests that are used to place riders into what they called grades. To be classified as a para-athlete you MUST have a permanent and measurable physical disability that is classifiable according to this manual. Once you are deemed eligible to be classified according to physicians and medical reviews, exams are done by physical therapists trained and accredited by the FEI. All of these exams are performed off the horse. Classification is a statement of fact regarding an individual’s physical performance, not one’s skill. From here, a rider is assigned a grade from 5-1 of similar functions allowing them to compete at a parallel level. There are so many ways to get started in this sport to test it out and see if it is something that interests you. Para-dressage is not the most well known sport, but often going to your local therapeutic riding center is a great way to start with riding lessons in a safe, structured environment. Additionally, the U.S. Para Equestrian Association is a non-profit that provides support and guidance to riders. From there you can learn about local competitions, clinics, and ways to connect with other riders. It is true that any of the equestrian sports can be more costly to get involved with; however, the para dressage community is extremely supportive. There are many ways to make it affordable through grants, leasing horses, and fundraising. As with most things, if you truly have the passion and drive, I believe there’s always a way to make it work. You never know what can happen in life, how quickly things can change. Many think I am crazy for getting on a horse after all I’ve been through, but they’ve given me back my life and spirit. Being on my horse was somewhere that I have always felt free. The equestrian sports allowed me not only to survive, but thrive. I’ve connected with so many horses and people who have looked past my disability. The self- confidence I built up through this sport and community is invaluable. I am who I am today not in spite of my disabilities, but because of them. I’ve had my own unique challenges, my own strengths and talents that I’ve nurtured, and my own weaknesses and disability that I’ve had to overcome. Riding for me is a way to test my ability and push past my physical and mental limitations. I have found my passion, and I know I will follow through with it with the help of my amazing family, friends, and a team of people at the barn who have supported me along the way! If you would like to learn more about Alanna or donate for her to compete 2018 World Equestrian Games and the 2020 Paralympics, please visit the links below.